Meet with new customers and suppliers – b2b meetings. Digital operating models versus local representation – Mutually beneficial or exclusive? Collaboration between teams in different countries – How to improve efficiency? Expanding business – What to learn from Swiss and Polish best practice examples? Blockchain – Is it the cross boarder business driver? 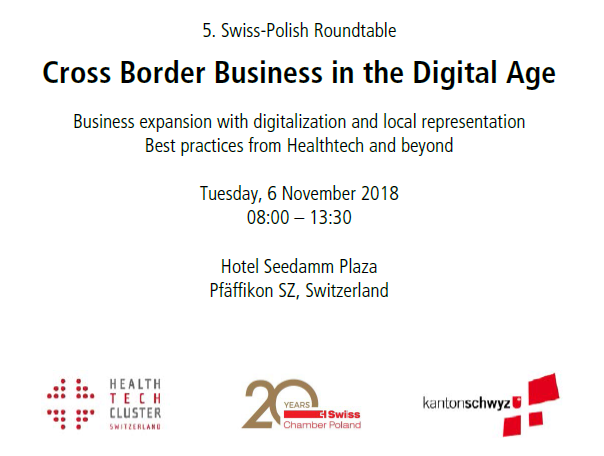 A registration fee of 200 PLN applies (100 PLN for members of Health Tech Cluster Switzerland or the Swiss Chamber Poland). We look forward to seeing you in Pfäffikon! International Project Leader DREBERIS Sp. z o.o.